People gather outside Ramsis train station in Cairo, Egypt, Wednesday, Feb. 27, 2019. An Egyptian medical official says 20 people have been killed and dozens injured when a major fire erupted at the main train station in Cairo. 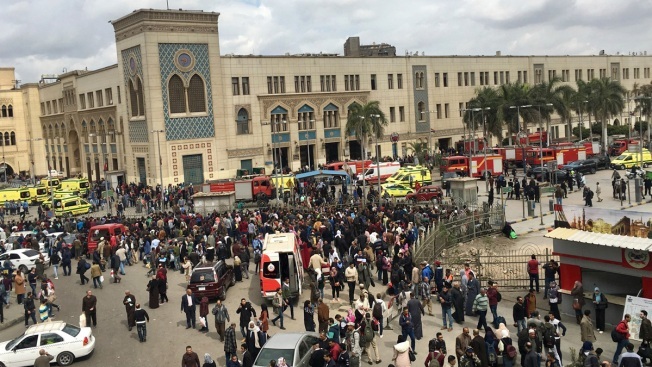 Mohammed Said, the head of the Cairo Railroad hospital, says the death toll is expected to rise further following the blaze on Wednesday. A speeding railcar crashed into a barrier at Cairo's main train station, causing its fuel tank to explode and triggering a huge fire that left at least 25 people dead on Wednesday, officials said. Railway officials said the train was speeding and collided head-on with the barrier. At least 47 people were also injured in the accident. Mohammed Said, the head of the Cairo Railroad hospital, said there are concerns the death toll could rise further following the blaze. Other officials spoke on condition of anonymity because they weren't authorized to speak to the media. Photographs from the station showed charred bodies lying on the platforms at the Ramsis station in downtown Cairo. Firefighters struggled to get the flames under control. Heavy black smoke rose into the sky as ambulances rushed to the scene. The Ramsis district is among the busiest and most crowded areas of the Egyptian capital. Videos from surveillance cameras inside the station showed flames ravaging the station. A video that surfaced on social media showed men and women carrying bags and personal belonging and walking on the rail platforms as the train car crashed and exploded. Another video showed men and women running, searching for exits after the explosion. A man runs back and forth, his shirt on fire, until another man rushes to pour water on him. Egypt's Prime Minister Mustafa Madbouli said authorities must determine "who caused the accident and hold that person accountable." He promised "harsh punishment" for the culprits. Egypt's railway system has a poor safety record, mostly blamed on decades of badly maintained equipment and poor management. Official figures show that 1,793 train accidents took place in 2017 across the country. In March last year, President Abdel-Fattah el-Sissi said the government lacks about 250 billion Egyptian pounds, or $14.1 billion, to overhaul the run-down railway system. El-Sissi spoke a day after a passenger train collided with a cargo train, killing at least 12 people, including a child. And in August 2017, two passenger trains collided just outside the Mediterranean port city of Alexandria, killing 43 people. In 2016, at least 51 people were killed when two commuter trains collided near Cairo.